View of Kelso Bridge and Abbey in Scotland. 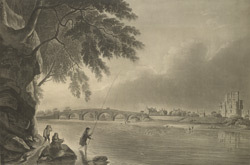 An earlier bridge at this point on the River Tweed was swept away by floods in 1797 and the arched stone bridge seen in this print was designed by John Rennie and opened in 1803. Kelso Abbey was built in the early 12th century for the Tironensian Order and is one of the finest examples of Romanesque architecture in Scotland. It became one of the richest monasteries in Scotland and the Abbot of Kelso was granted the right to wear a mitre giving him status above all other Scottish Abbots. Its position near the boarder between Scotland and England made it very vulnerable and the Abbey was destroyed during the Reformation of the 16th century.